You’ve seen it by now, right? The big close-up of the former quarterback’s face, overlaid with the words “Believe in something, even if it means sacrificing everything.” It’s another controversial marketing decision by Nike, but what does Nike’s support truly mean for Colin Kaepernick’s message? The ad came out just a few days after it was announced that Kaepernick, former San Francisco 49ers quarterback and pioneer of the divisive anti-police-brutality protests during the national anthem of NFL football games, was to become the face of Nike’s newest ad campaign. You know the story by now. 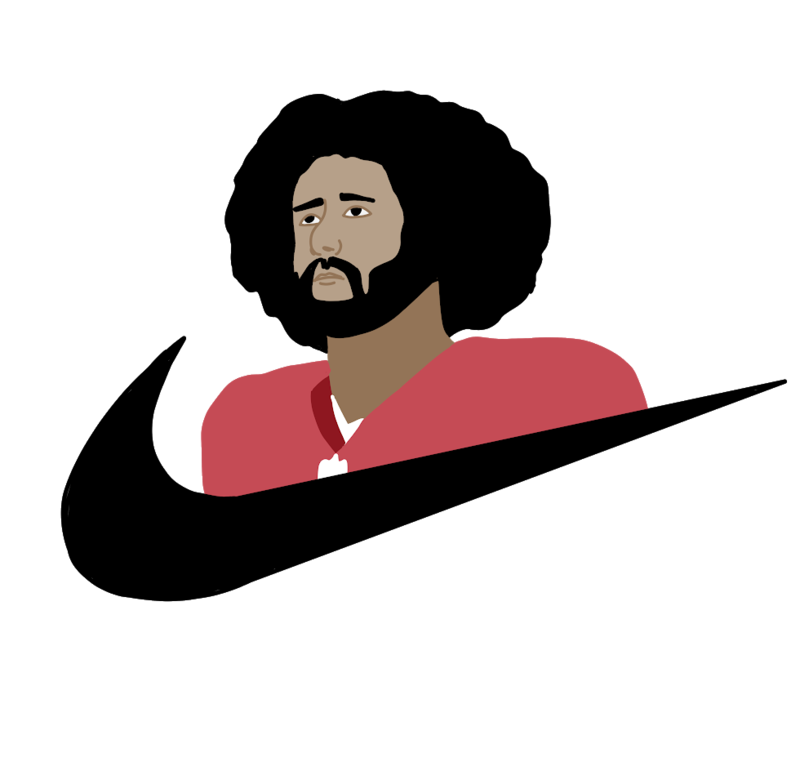 Kaepernick began the protests back in 2016, sitting on the bench during the Star-Spangled Banner in the first few preseason games. Kaepernick, in talking to U.S. military veterans, decided to switch to kneeling during the anthem proceedings, as it was seen as more respectful to the flag than simply sitting. Kaepernick’s teammate, Eric Reid, joined the quarterback in kneeling during the anthem in solidarity, and soon players from around the league were kneeling left and right, hoping that their position as entertainment figureheads would help their protests against wrongful police brutality and poor prison conditions gain traction. Boy, did they. Just not in the way they expected. The protests were met with a vehement backlash. With the election of President Trump, more and more NFL players started to kneel or sit for the anthem, showing their displeasure with the president. He took to Twitter, calling out the athletes for a lack of patriotism and disrespect for America. Many of his supporters agreed with him, saying that the protests were ridiculous. Trump’s tweets showed a complete lack of understanding for what the players’ message really was. To him, the kneeling was an attack on America and, by extension, an attack on him. Support rang out from middle America, with football fans defaming and boycotting the league. Many former fans went so far as to burn their team’s apparel, which, you know, didn’t really do anything except waste money that they had already spent. The NFL season went on as scheduled in the 2017 season, with flare ups coming and going as people remembered to be angry about something that they didn’t care or try to understand the point of. In the offseason this past year, the NFL owners attempted to make it fineable and suspendable to protest during the playing of the national anthem. The NFL Players Association took grievance with the movement, saying that it was unconstitutional and just generally messed up. These talks are still ongoing, and the anthem protest ban has been halted at this point. Nike’s role in all of this is a curious one; it seems that executives are banking on young liberals who support the protests to love that a big corporation backed up a controversial subject. It’s a marketing scheme. Nike has sweatshops all over Asia. They’re not a beacon of moral good by any stretch of the imagination, but riding the coattails of someone who put his career on the line to stand against injustice is good for business. Still, Nike has a unique position, as they hold the exclusive uniform contracts for all 32 NFL teams, and they’re a gigantic sponsor of the NFL and anything football related. Kaepernick remains out of a job and is fighting the NFL owners in a collusion lawsuit, arguing that the NFL teams collectively decided not to offer him a place on a team because of his outspoken political beliefs and actions. With some of the quarterbacks starting this week’s opening games, it’s clear to see that it’s likely true (looking at you, Nathan Peterman). Now, the problem is that the same former NFL fans who burned jerseys and memorabilia are doing the same to their Nike gear. Again, this doesn’t make any sense and is just a waste of perfectly good clothing, but go off, I guess? Fans are simply outraged for the sake of being outraged. The First Amendment of the Constitution is about freedom of speech, assembly, and press. There’s no good reason Kaepernick should be out of a job at the NFL level for expressing his beliefs. There’s absolutely no reason that NFL fans should be boycotting Nike’s products. People who are upset about this have things backward. Regardless of your views on things like police brutality and for-profit prisons, Kaepernick, and all the NFL players, have a right as citizens of the United States to use their platform as famous athletes to protest racism in this country, without fear of losing their jobs. It’s 2018, folks. It’s time to wake up.